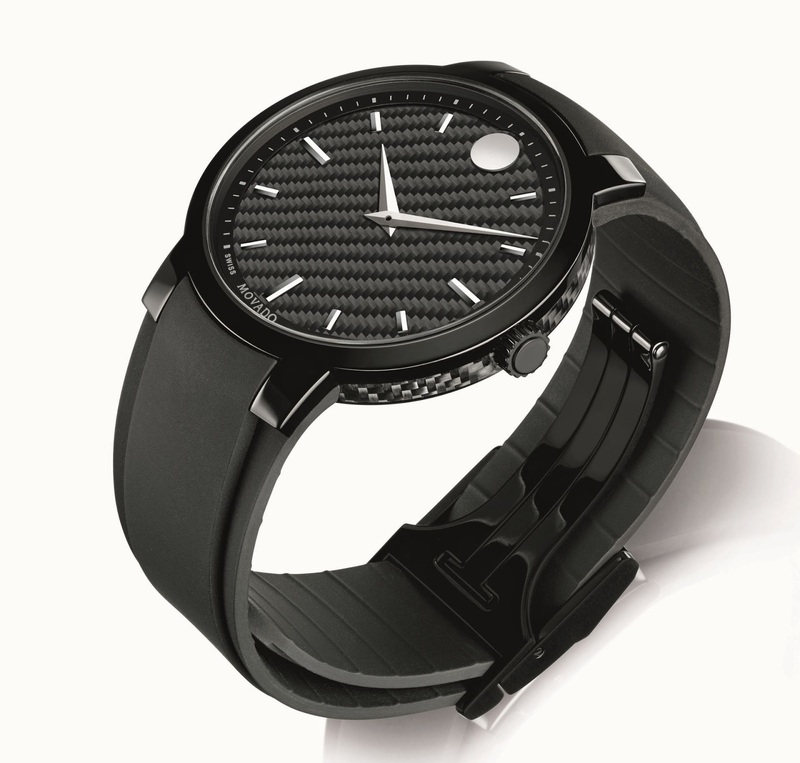 For 2014, Swiss watch maker Movado introduces Gravity, a compelling watch design infused with a bold, creative spirit. 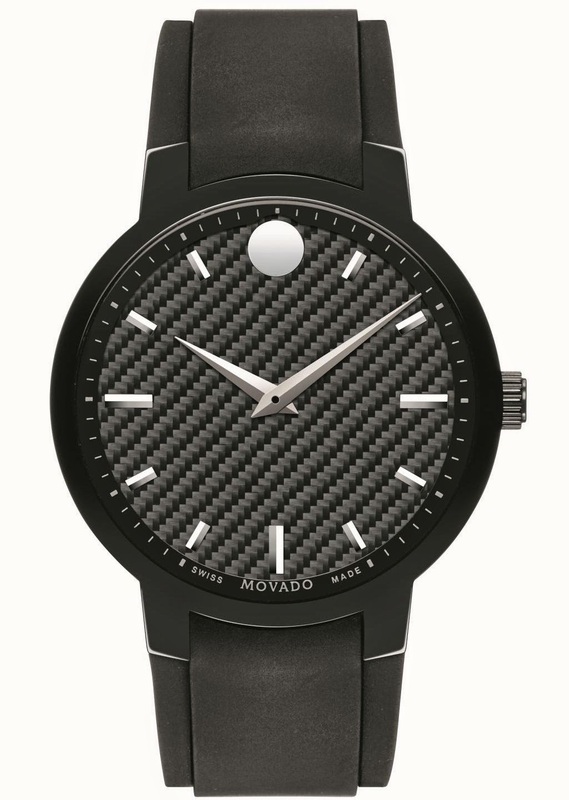 This striking men’s timepiece explores Movado’s modern design aesthetic with edgy, innovative sophistication. Giving sleek and daring shape to time, Gravity’s round 42mm case with sculpted extended lugs is rendered in polished black PVD-finished stainless steel. Viewed in profile, the case, only 8mm deep, reveals a layer of carbon fiber sandwiched between the glossy black PVD surface and case-back. A glare-reducing domed sapphire crystal makes it easy to appreciate the distinctive shiny black carbon fiber dial and its brightly polished details: a black minute reflector ring, and silver-toned dauphine hands, applied domed bar indices and flat signature dot at 12 o’clock. The bi-level black rubber strap joins the case in a fluid, fully integrated design. The strap’s raised and lightly textured middle section rises to meet the curved edge of the bezel, while its smooth outer edges flow down and under the lugs. Sportive and supple, it conforms to the wrist for comfort and secures with a push-button deployment clasp. Featuring a modern and innovative design, the new Movado Gravity pulls the traditional art of watchmaking forward in time. Fine Swiss quartz movement. Water resistant to 3 ATM / 30 meters. 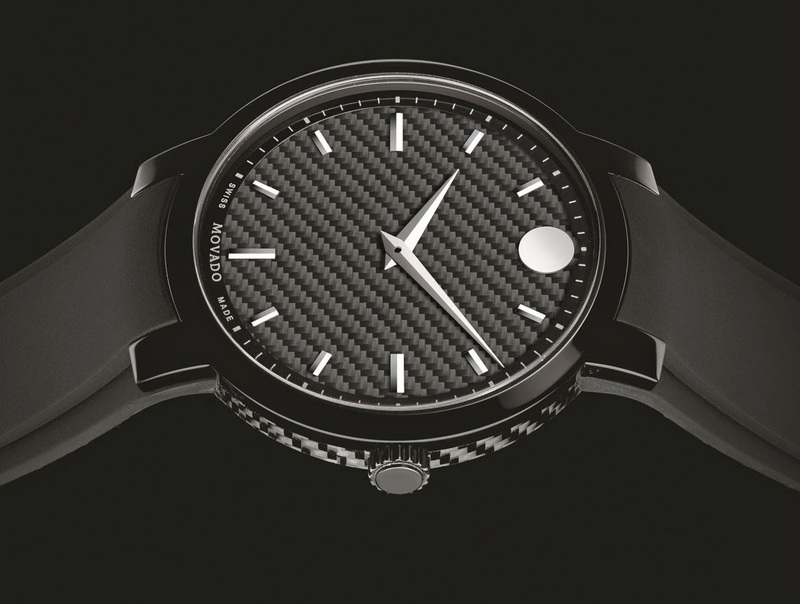 Shiny black carbon fiber dial with polished black minute reflector ring; and polished rhodium-plated dauphine hands, dome-shaped indices and flat signature Movado dot at 12 o’clock. Fully integrated bi-level black rubber strap with smooth edges, lightly textured raised middle insert; pushbutton deployment clasp.